The Malaspina is one of the largest vessels in the Alaska Marine Highway System. As if on cue, the glacier emitted a deep rumble and then calved an enormous slab of blue ice into the waters of Tracy Arm. 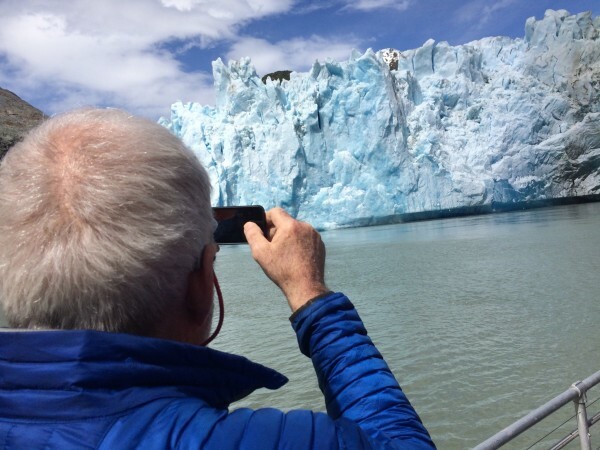 We’d slowly dodged icebergs, bergy bits (small icebergs) and growlers (even smaller) for several hours before coming face to face with the frigid beauty of Sawyer Glacier and witnessing the dazzling performance. This is why we had come to Southeast Alaska’s Inside Passage—for the drama and beauty of nature—and nature didn’t let us down. A network of waterways through an island maze on the Pacific Coast of the U.S. and Canada, the Inside Passage extends from Puget Sound in northwest Washington to Skagway, Alaska. The Alaska stretch weaves through the 300-mile long Alexander Archipelago, home to more than 1,100 islands separated from the thickly forested mainland by deep, often narrow channels. Though Southeast Alaska is only an appendage to a giant fist of a state, the region is not without natural superlatives, among them Tongass National Forest, the largest national forest in the U.S. with 17 million acres; and the 1,500-square-mile Juneau Icefield, fifth largest in the western hemisphere and home to the popular Mendenhall Glacier. There are several ways to explore the Alaskan panhandle—on enormous cruise ships with thousands of passengers, on small ships with 10-to-100 travelers, on a private craft or via an Alaska Marine Highway System ferry, the regional travel lifeline. Our journey was instigated by a friend who suggested we join her on a small-ship cruise, but after checking out the itinerary and cost, we decided to see more and spend less by designing our own two-week ferry journey. 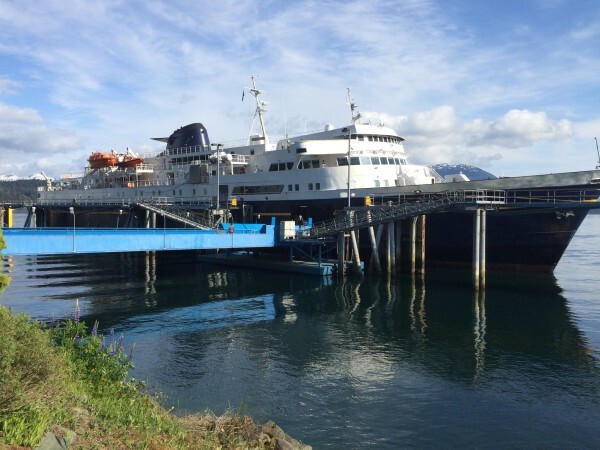 Fifty-three years ago, the Alaska Marine Highway System (AMHS) launched regular ferry service in the Inside Passage, a godsend to isolated coastal communities carved out of the wilderness. Service soon expanded to other parts of Alaska where the rugged terrain limits a land-based road system. Today 30 communities are served along 3,500 miles of coastline by a fleet of 11 ships. The AMHS is the only marine route to be lauded as a National Scenic Byway. As the travel planner for a late May adventure with my husband, sister and brother-in-law, I created an itinerary before the 2016 ferry schedule was released. Alas, the schedule designers and I were not in sync and it took considerable rearranging to accommodate our interests with the ferry schedule. After the fact, we all agreed that the itinerary was perfect and with the exception of one more day in Glacier Bay (nixed by the schedule), we wouldn’t have changed a thing. Creek Street in Ketchikan, where “both men and salmon came upstream to spawn” when it was a red-light district. First stop, Ketchikan, gateway to the Inside Passage. Hugging the southwest shore of Revillagigedo Island, Ketchikan began life as a salmon cannery site in 1885. Fishing, mining and logging have all contributed to the community’s development though it’s been tourism—especially from cruise ship passengers—that has played the largest role in the its fortunes. A welcoming (if a bit hard- edged) community, Ketchikan is described as “31 miles long and never more than 10 blocks wide”—that’s about all the adjacent wilderness will allow. The only way in or out is by water or air. We arrived by the latter, a flight from Seattle to Ketchikan International Airport on Gravina Island, then took to the former in the form of a 5-minute ferry transfer across the Tongass Narrows to Ketchikan. Now that the notorious “Bridge to Nowhere” projects appears permanently scrapped, the ferry is the only airport shuttle in town. The community of 8,000 clusters around the main harbor, then spreads out in both directions along the waterfront, with structures built on stilts over the water and up steep slopes accessed by winding wooden staircases. As unique as the architecture were the locals we met while riding the bus and sipping Alaskan Brewing Company IPA at a popular restaurant, Bar Harbor. A collection of long-timers and recent arrivals, they were without exception proud of their town and the lifestyle it offered—150 average inches of annual rain nothwithstanding. 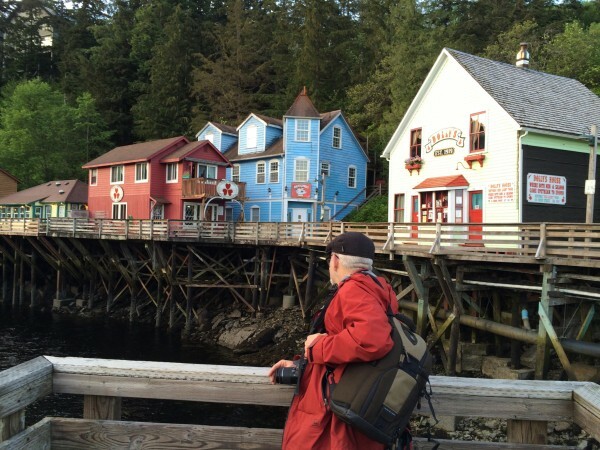 Among our favorite experiences in Ketchikan: Creek Street, an antique boardwalk constructed on pilings over Ketchikan Creek and originally the town’s red-light district where signage proclaimed that “both men and salmon come upstream to spawn”; Southeast Alaska Discovery Center, which affords an excellent introduction to the Tlingit, Haida and Tsimshian tribes, early inhabitants of Southeast Alaska whose cultural and artistic heritage are still very evident. Though we didn’t make the trip, local intelligence rated Misty Fjords National Monument as a spectacular adventure, particularly if one boats out and flies back. Native American totem poles—stately, often whimsical, symbols of commemoration, legend and lineage hand carved from western red cedar—were a fascinating fixture of the landscape throughout our journey. Ketchikan boasts 80, the world’s largest collection, and is home to Totem Bight State Historical Park (my personal favorite), Saxman Native Village and the Totem Heritage Center. Colorful Native American totem poles decorate landscapes in communities throughout the Inside Passage. One couldn’t miss the Malaspina, our ferry to Skagway, when it docked in front of our hotel. One of three sister ships that made up the original AMHS fleet in 1963, the sturdy vessel is 408 feet long and accommodates 450 passengers and about 100 vehicles. We were anxious to get aboard and explore what was to be our home for 27 hours. The four-bunk cabin with bath and shower we had reserved was cozy but comfortable and a window kept claustrophobia at bay. We staked claim to a table in the forward lounge so we could play cards while taking in the view. Once underway, passengers moved about the boat, walking laps around the deck, taking a meal in the dining room, watching movies in the theater and just savoring the panorama. We’d heard that large ferries had an upper deck that permitted camping, and sure enough, we discovered a bevy of tents and lounge chairs strewn with sleeping bags. Covered but open air, the deck had heat lamps to ward off the marine chill. Sadly, passengers wishing to sip a beer while watching for wildlife are out of luck—Alaska budget cuts resulted in the closure of the popular ferry lounges in early 2015. Travelers with reserved cabins can imbibe there but there’s not room for much of a party. Binoculars at the ready, we scanned the calm water for whales, the mountainsides for bears and tall trees for what looked like white golf balls amid the branches but which were actually bald eagles. Whenever wildlife was spotted, the news rippled through the ship and there was a collective dash outside to the deck. The ferry docked in Wrangell, founded by the Russians in 1834 as a fur-trading settlement, and we had an hour to wander the lanes lined with flower-festooned cottages. Today fishing and tourism keep the community afloat. Visitors in July and August can catch the show at Anan Bear and Wildlife Observatory when bears fish for salmon in Anan Creek, with the largest pink salmon run in Southeast Alaska. Departing Wrangell, we were in for a show of our own—the Wrangell Narrows, a 22-mile tidal waterway notorious for challenging even the finest navigators. Sixty-five navigational markers help guide the way, yet “recorded incidents … have occurred at the rate of nearly one every ¼ mile.” We were captivated by the shoreline, which felt nearly close enough to touch, but relieved when we docked at Petersburg, alas too far from town to deboard. We snoozed and the ship cruised, docking in Juneau just after 3 am. By the time it departed for Skagway an hour later it was starting to get light so we had coffee (the espresso machine spent more time out of service than in) on deck and watched the sunrise. A bald eagle soars above an enormous iceberg floating in Tracy Arm. As delicious as we found the scenery throughout our journey, the cuisine—not so much. Meals were quite pricey—not surprising since all goods must be shipped or flown in—but rarely memorable. Ferry dining room fare was hit-or-miss and lines often long. Our best meals were in pubs frequented by locals. The weather gods were with us but can be fickle so be prepared. We traveled the last two weeks in May and skirted the rain until our last night in Sitka and savored a number of sunny days in the 60s. Casual clothes and multiple layers served us well on land and sea. Though not big shoppers, we do look for authentic finds when traveling—but discovering unique works by local craftsmen was a challenge, so prevalent are the jewelry shops reminiscent of a Caribbean port of call. A shopkeeper in Sitka introduced us to Northwest Pewter and we took home several handsome pieces. Look for “Made in Alaska” stickers, which certifies that at least 51% of the product was made in Alaska. The hotel selection is somewhat limited, perhaps because so many visitors arrive by and stay on cruise ships. In Ketchikan and Juneau, we found the Best Westerns to be serviceable and both happily shuttled guests to attractions and restaurants. Westmark hotels are a good bet in Skagway and Sitka. If the choice was between hotel amenities and access to attractions, we chose the latter. Communities are compact and so we walked nearly everywhere. When a destination was deemed too far to hoof it, we jumped on the local buses. Hotels were generous with shuttles around town and to ferry terminals. We rented a car one day in Juneau simply so we could cover more ground in our limited time in this spread-out community. Nearing the end of our overnight voyage, we cruised leisurely up the Lynn Canal, the deepest fjord in North America (outside Greenland), unaware that we would soon forsake the peaceful Coast Mountain wilderness for a crush of cruise ships. The Malaspina may be one of the, largest vessels in the Alaska ferry system, but it was dwarfed by the three towering ships we encountered in the Skagway Harbor. A fourth joined the fleet later that day and we found ourselves part of dubious history—the first time more than 10,000 cruise passengers descended on Skagway in a day. The front of the Skagway Visitor Center is paneled in driftwood. Inhabited by Tlingit people from prehistoric times, Skagway became a boom town in the late 1800s when gold was discovered in the Klondike region of Canada’s Yukon Territory. Hopeful prospectors flocked to the settlement, where they collected supplies for the 500-mile trek to the gold fields. In 1898, with a population of nearly 10,000, Skagway was the largest community in Alaska. Today, the permanent population is just over a 1,000, doubling during summer months to support the influx of tourists. Back in Skagway, we took to side streets to avoid the throng that populated the boardwalks on Broadway, the town’s historic main street and found refuge at the Skagway Brewing Company. We’d been tipped off that this cheery pub was local favorite and it quickly became ours as well, with an excellent sockeye salmon salad, some of the best carrot cake I’ve had anywhere and a new favorite brew, Spruce Tip Blonde Ale. And yes, it is brewed with local spruce tips, some of which are picked by locals in exchange for free beer. Just around the corner on 7th Avenue, the Skagway Museum showcases Yukon and Alaska native artifacts in the first stone building in Alaska, shared with City Hall. We toasted our goodbyes to Skagway at another pub, the Red Onion Saloon, which operated one of the most famous local bordellos during the Gold Rush and, with wait staff in period costumes, still offers a naughty charm. We boarded the Haines Skagway Fast Ferry for a 45-minute ride partway back down the Lynn Canal to Haines, population 2,500, where we were greeted by only one, smaller cruise ship and the stunning Takinsha Mountains backdrop. The area was settled originally by the Tlingit tribe, who still maintain a strong cultural presence. The actual town of Haines developed around a mission school built in the 1880s to educate native children, and prospered through natural resources of gold and fish. Fort Seward was built in Haines in 1902, a display of Army strength in Alaska that became a training and staging area for troops headed to combat in the Aleutian Islands during World War II. We took advantage of another crisp, dry day to float through the Chilkat Bald Eagle Preserve with Andy Hedden, owner of Haines Rafting Company. We were too early for the “Fall Congregations” (October-February) when the salmon run attracts more than 3,000 eagles to this 34-year-old preserve created to protect and perpetuate the world’s largest concentration of Bald Eagles. But multiple eagle sightings and stunning scenery as we drifted beneath lofty mountains, hanging glaciers and thick forests made for a most memorable adventure. Juneau—state capital and largest city on our itinerary with 30,000 residents—spreads for miles along a long, narrow sliver of coast. Though settled centuries earlier by the Tlingit, gold put Juneau on the map as a town in 1880. During the next 60 years, Juneau was home to three of the world’s largest gold mines. Pleasure travel by boat to Juneau dates back to Gold Rush days, and mining and tourism still are major contributors to the local economy, along with fishing and government. We launched our tour of downtown Juneau with a 45-minute Trolley Tour that—though a bit kitschy—took us to parts of the city that we wouldn’t have gotten to on foot, and across Gastineau Channel to Douglas Island, home to remnants of the Treadwell gold mine, Eaglecrest Ski Area and about 20 percent of Juneau area residents. On foot, we wandered into the Red Dog Saloon where the gun that Wyatt Earp left behind is displayed behind the bar, the Sealaska Heritage Institute, a treasure trove of native art and culture, and Rainy Retreat Books, a friendly new, used and rare book shop. The highlight of our Juneau stopover was actually several hours south, a cruise to Tracy Arm fjord aboard the 65-foot Captain Cook, arranged through Adventure Bound Alaska. Sheer rock walls, steep, verdant cliffs and endless waterfalls rimmed our voyage 20 miles deep into the narrow waterway. 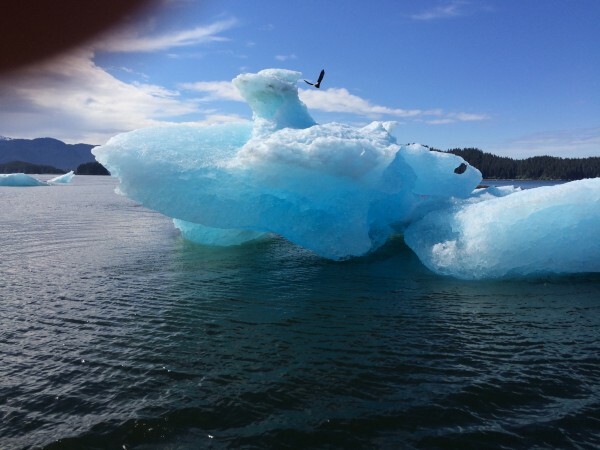 Floating in the turquoise water, ice floes from small-house-to-dog-house size made navigation challenging, but our skilled captain piloted us safely to the foot of Sawyer Glacier—the most beautiful of our entire Alaska journey—just in time for it to calve. On the return trip, we spotted seals sunbathing on icebergs and a pod of leaping humpback whales escorted us back to the harbor. A perfect day. On our last day in the Juneau area, we rented a car to view the rapidly receding Mendenhall Glacier, a finger of the massive Juneau Icefield accessorized by a beautiful iceberg-dotted lake and thundering waterfall. Then we drove “out the road,” as the locals say, to hike in Point Bridget State Park, where post-glacial rebound has lifted the landscape, and wander around Shrine of St. Therese, a lovely lakeside retreat center. Sawyer Glacier in Tracy Arm fjord calved on cue for the passengers on the Captain Cook. Four hours by ferry from Juneau, on the more compact Le Comte this time, landed us in the town of Gustavus—basically a four-way intersection with a few shops and galleries, and our entrée to Glacier Bay National Park. 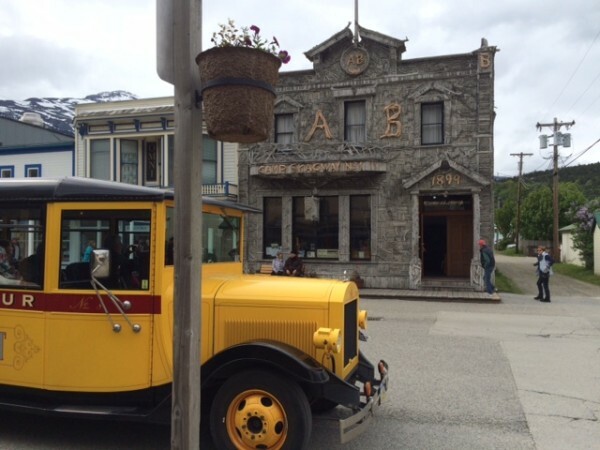 We rambled from the ferry terminal to Glacier Bay Lodge, the only hotel in the National Park, in a repurposed school bus. Set on the shore of Barlett’s Cove, the Lodge was a cozy home for our stay, with beach walking and rainforest hiking right out the door. The low-hanging clouds lifted soon after our arrival for a spectacular panorama of the Fairweather Mountain peaks. John Muir’s 1879 expedition to Glacier Bay and his discovery of Muir Glacier set the stage for turn-of-the-century tourism here. Though most of the region’s glaciers have receded greatly since Muir’s time, there remains much beauty to behold. A day-long wildlife cruise on Glacier Bay introduced us to tufted puffins, brown bears, mountain goats, sea lions, sea otters and humpback whales and several impressive glaciers, including the magnificent Margerie, one of the few glaciers that’s still actually growing. Our foray up John Hopkins Inlet to view its glacier was restricted because it was seal pupping season and the head of the inlet is a popular birthing spot. Similar attention to the habits of Glacier Bay wildlife is evidenced by “slow zones” where vessels are required to drop their speed because of the frequent presence of humpback whales. Not surprisingly, we shared the far end of the bay with a cruise ship and for once, we were glad for the encounter—viewing the ship in front of the Margerie Glacier put the snow field’s immensity in perspective. 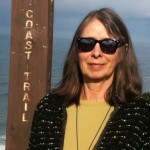 Park regulations limit the number of cruise ships in the bay to two a day to minimize environmental impact. The enormity of Glacier Bay National Park and Preserve—3.3 million acres of mountains, glaciers, forests and waterways—made us feel quite alone, and frankly, insignificant. Our rich wilderness day was enriched even further by a contingent of Huna Tlingit children, for whom the boat trip and an overnight at Glacier Bay was the culmination of a nature project on the region. Between traditional songs and dances, they approached us to share some of what they’d learned. We were completely charmed. 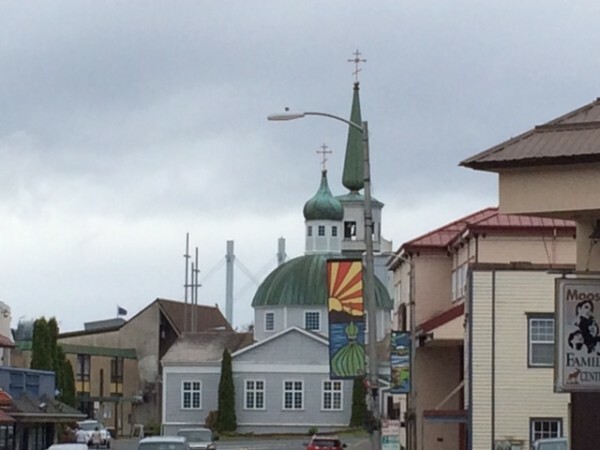 The Sitka skyline showcases its Russian heritage. Sitka, an overnight ferry journey from Juneau, was our final destination. Aboard the Le Comte, we dozed in lounge chairs, waking up to a misty dawn as the ship navigated the narrow Neva Strait. The sun was barely up when we were greeted at the dock by the cheerful driver of a local tour bus, who treated us to tidbits about her town on the drive to our hotel. Who knew that James Michener lived there while writing “Alaska?” And that the Sitka City and Borough encompasses 4,710 square miles, making it the largest city in the U.S? Arranged along a protected bay on Baranof Island with less than 20 miles of road, Sitka pays homage to the Tlingit and Russian cultures that shaped its history with a skyline marked by totems and onion-shaped domes. The community was called “New Archangel” by its Russian settlers in the early 1800s until the U.S. purchased “Seward’s Folly” in 1867. To the north massive Mount Edgecumbe, a dormant volcano, keeps watch over the community of 9,000. Since we arrived too early to check into our hotel, we dropped our bags and headed off on foot to the Alaska Raptor Center, a 17-acre sanctuary, education and research facility on the Indian River where each year 100-to-200 injured bald eagles and other raptors receive medical treatment. Lucky birds—including owls and hawks as well as eagles—are rehabilitated and released; also lucky are those not fit for the wild who receive lifetime sanctuary. In the Flight Training Center, we spied on eagles convalescing and conditioning in natural surroundings until it’s time to again to take wing. We did our museum due-diligence at several worth the visit (Sheldon Jackson Museum; Russian Bishop’s House; St. Michael’s Cathedral), but it was more of Sitka’s wildlife that made the biggest impression. At Fortress of the Bear, we watched coastal brown bears and a trio of orphaned black bear cubs frolic, swim and nosh in safe but close proximity. The long-term goal of the Fortress is to pioneer a pilot rehabilitation program for the state of Alaska to eventually be able to return bears to the wild. With no such program in place, the current residents are among the lucky few to have been rescued and given sanctuary. 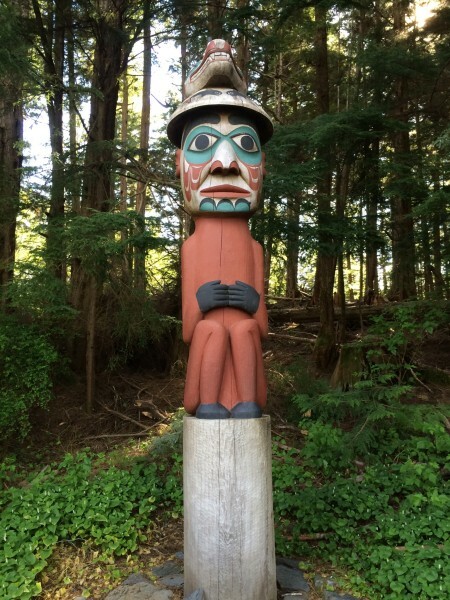 With our Alaskan adventure winding down, we savored a last rainforest hike and totem viewing in the Sitka National Historical Park, which commemorates the 1804 battle site between the resident Tlingit people and invading Russian traders. The park visitor center affords the chance to watch and chat with native craftspeople at work. Shopping in Sitka—especially for Southeast Alaskan crafts—was the best of the trip. One shop owner proudly told me that only two stores along the main street were not locally owned. Over the last meal of our Inside Passage adventure, served by the charismatic Ramon (on whom, we’re told, the character of the same name in the Sandra Bullock movie “The Proposal” is based), we marveled—at how easy and comfortable it had been to travel by ferry, at the incredible beauty of the scenery, and the genuine warmth of the local people. Our weather fortunes did turn that evening with a downpour, but our early morning flight took off into a rainbow. Nature never let us down.